Haida Co, in a nutshell, is a brand that produces authentic, one-of-a-kind accessories using 100% plant-dyed weavings. Haida sources artisans from remote East Indonesian communities for the creation of their products with the intent of bringing positive change to these regions. Each piece is completely unique and made under fair-trade principles (see ya later mass production), not to mention that they’re just absolutely bloody beautiful. Sumba, one of the poorest islands in the Indonesian Archipelago, is at the heart of Haida. Malnutrition is widespread in Sumba, and with the majority of its inhabitants living below the poverty line without access to clean water or basic health care, infant mortality is amongst the highest in the world. Despite this, the people of Sumba are known for their strong tribal culture and rich ancient traditions, and are a world treasure in terms of art and culture. This is where Haida comes in. Minimal negative environmental impact is one of their top priorities, and they believe that fashion and handcraft are powerful resources that can be utilised as tools for cultural and socioeconomic development. Haida’s founders, Candice and Lou, saw enormous amounts of potential in Sumba, despite the misfortune that its people had to suffer through daily. Candice and Lou wanted to do something to help, and the Sumbanese were up to the challenge. 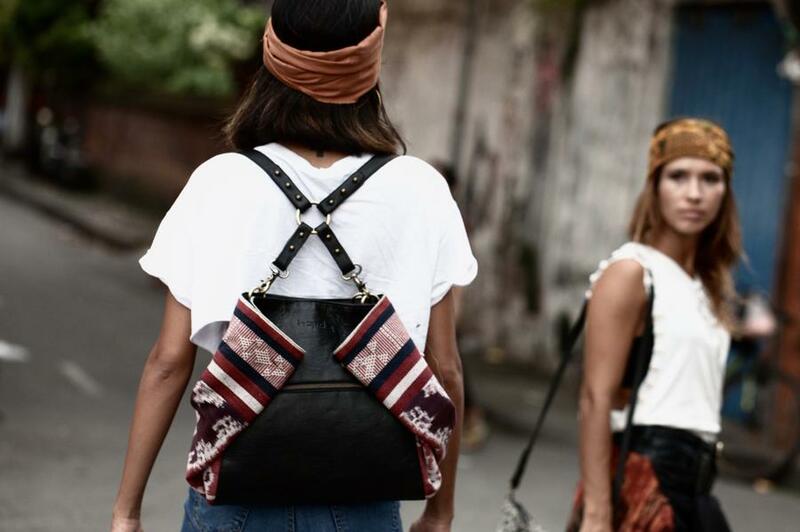 Haida Co only uses natural fabrics, beading and high-quality leather in their products, products that are 100% hand-made by Sumbanese and Balinese artisans. The ikat and songket are two traditional weaving techniques employed in the creation of Haida’s products, and all of their natural dyes are completely plant-based. Also, although they only use the highest quality cow leather, they’re looking at transitioning to leather alternatives in the future. Pinatex, a fiber made from pineapple leaves, is one of these. Just remember that when you buy from Haida you won’t just be purchasing an authentic bag or jacket that also doubles as an incredible work of art, but you’ll also be supporting and empowering artisans and their families in some of the most remote parts of the world, and providing them with a better quality of life. An interview with Candice and Lou, the co-founders of Haida Co.
What made you start Haida Co? We were seeking adventures and inspiration, but we found much more. We found people, and we strongly believe that all humans have within them a potential energy to create something beautiful and meaningful. The deeper we go into traditional cultures, the more we see beauty and simplicity in the meaning of life. Having a particular interest in handcrafts, we realised every time a little bit more how talented and gifted traditional cultures were. Their well-preserved knowledge passed down from generation to generation always fascinated us. Then the purpose of our travels slowly became obvious. We were looking for talent, for traditional heritage, for world treasures. After being tired of working for profit-driven companies that don’t appreciate their number one resource—human beings—we wanted to make a change and share our stories around us. We wanted to create a meaningful business, and ensure a more transparent future. We wanted to invest in people. What is the meaning of the name - Haida Co? “Haida” means “people” in the language of the Haida Gwaii, the native community of Alaska. Through Haida Co you can see directly the people you are influencing through purchasing our unique pieces. This goes along with our vision of transparency. No sweatshops, no evil corporations, no synthetics, no dirtiness hidden in the darkness. Just pure love, joy, happiness and hard work. Real people, Haida People. What is something others wouldn't know about creating an ethical business that you think they should? You have to be innovative but patient. You are constantly thinking about how you could have a better impact on people and the environment through every single step of your business—much more than you could ever imagine. It is not always easy but it’s seriously worth it! What has been the most challenging thing you have uncovered since the beginning? To be honest, we have been working on this project for more than two years. Money and time have been our major issues. When we were working, we had no time. When we had free time, we didn’t have enough funds to make everything happen the way it should. We needed to go to the source, to know more about the story of our fabrics and their makers. But, the positive point is that it gave us the time to build a stronger network and a better understanding of the culture. Being able to speak Indonesian facilitated a lot of the communication with most of our actors and partners. Within the ethical fashion community, there's a big question that we ask which is 'Who made my Clothes?'. In the scope of Haida Co, who made your bags and clothing? Can you tell us a bit about them? Our weavings are made and naturally dyed by artisans in Indonesia. Each Haida piece is an authentic one of a kind artwork 100% handmade by Sumbanese and Balinese communities. We want you to understand that quality is more elegant and sustainable than quantity. We are proud of our tribe. We want to create a positive impact around us. Our purpose is to empower our artisans, valuing and introducing their incredible ancient skills to the world. Focusing on traditional culture, ancestral techniques, natural fabrics and dyes, we aim to contribute to a new kind of consumerism where we value each other, our environment and the cultural knowledge that makes every single piece we create unique. An infinite gratitude to every human taking part in this adventure. She is the sweetest one. She’s the kind of human that will always send you positive and happy vibes. She has the purest heart where only love resonates. Eka takes care of us as her own children. She knows how to make us feel home and we always consider her as our "Balinese Mama". So much love and respect for this woman. Eka has a small factory in the capital Denpasar. She has been working in the industry for over 20 years. Her experience and knowledge in this sector has been a strong asset for us. The quality and design of each piece are carefully guided by this incredible woman. She is a key element of our team. Rambu Ana is a beautiful and smiling Sumbanese woman. She comes from a long line of weavers and knows absolutely everything about the Ikat history and making process. Visiting her workshop is always such a rich experience and we learn some more traditional knowledge about our fabrics every single time. Rambu Ana is a very talented weaver. She learnt from a very young age how to master the complex songket weaving technique and because she was so passionate, she also learnt other weaving techniques like ikat. She can explain to you very well where all the pigments she uses for the natural dyes are from. She is well-known in the sector as she already came to Bali in the past thank to Threads of Life, a fair-trade business that works with culture and tradition conservation to alleviate poverty in rural Indonesia, and to teach about natural pigments. We believe in paying fair prices and wages to those we work with us. Paying fair wages is as important to us as every other part of our business. It is one of our company’s core values to elevate the standard of living in all the parts of the Haida Tribe. Best piece of advice you have ever received? "Do what you love, and do a lot of it." One tip you'd give to others who are wanting to start their own business? Surround yourself with people that inspire you and motivate you to reach your goals. Don't be scared to ask for help. When you have a good idea, especially to make this world a better place, people are willing to give a bit of their energy to make your dream come true. Where do you envision Haida Co in the future? We believe in the incredible power of the Fashion Revolution movement. We believe in stimulating consciousness. Our purpose is to empower our partners and customers to stand up for change, to love and value all kinds of beings. We are currently working with two communities in East Sumba. We are planning to work with one to two more within the year. Our dream is to collaborate with different tribes and communities around the world. What or who inspires you to do what you do on a daily basis? Travelling a lot and living in developing countries helped us to change our perspectives. What is important in life? We would say the most important thing we learnt is sharing, without ever expecting something back. The universe will send it back to you. Do you have a morning routine? If so what is it you do to set yourself up for the day ahead? Yoga, ocean therapy and coconut. Almost everyday! We were born on a Caribbean island and ocean is the place we resource and reconnect with ourselves. Yoga and meditation help us to focus and handle our emotions. Taking care of yourself is the number one advice to succeed in what you do. One book everyone should read? Why? "La Puissance de la Joie" or "The Power of Joy" by the French philosopher and sociologist Frédéric Lenoir. This book is for us a path to liberation and love. It empowers us to save ourselves from the fictitious happiness proposed by our narcissistic and consumerist society. It is also a different perspective of wisdom more accessible to us busy bees, stimulating our emotional intelligence. Are there any other Movers & Shakers out there in your world that you think people should know about? Bali is a very creative and stimulating island. We meet people from everywhere with amazing projects and initiatives. If you do not yet know the “Bye Bye Plastic Bags” project, I recommend you check out this community of teenagers willing to change the dramatic unconscious plastic consumption here. Single Use Plastic in Indonesia is a massive problem. We have the second most polluted seas on the planet, after China. This is the result of a fast economic development (mainly driven by the tourism industry), and we do not have the appropriate policies and infrastructures as well as education and social development.